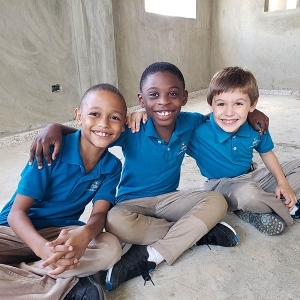 Arbor Christian Academy provides a Christian education to families with Kindergarten through second graders living in the San Francisco de Macorís region of the Dominican Republic. This TeachBeyond partner recently completed its “Block by Block” building campaign and the construction of the school’s second floor. This will provide space for the school to expand through grade 5 in the coming years. It also adds space for Arbor’s English as a Foreign Language classes. In order to make connections in the community, the school started a program called Descubre Inglés (Discover English). They have students from 3 to 65 years old. Jessica Moulding, Arbor’s principal, said the program is popular because they not only teach from a book, but also add games and activities to make it fun to learn English. With the completion of the second floor, Arbor needs help to move “Beyond the Blocks” and complete this addition to their building. Donations will furnish and paint their four new classrooms. You also can give towards desks, chairs, fans, whiteboards, and other essentials by clicking on the button below the video. Watch some of the construction in this video from teacher Ellen Kujawski.